Prudencio Saez 56 Cutaway Electro Classical Guitar Thin body. 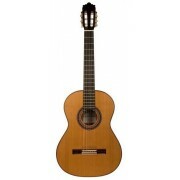 This electro-classical guitar with thin body (75mm) has everything you can expect from a Made in Spain classical guitar and the adition of a comfortable and flexible cutaway body and electronics from Prudencio Saez. Made with a solid cedar top and rosewood back and sides, the model 56 from Prudencio Saez also incorporates a Truss Rod inside the neck for adjustability to the player's needs. The sound is surprisingly full of body and very well balanced. Inorporates the Fishman Clasica III Pickup and preamp system.